During the 1920s, Italian energy company SADE, embarked upon a project to build a massive dam in the valley of the Vajont River. It took decades to build and during the construction period SADE assured authorities that all the proper studies had been conducted, including past landslides. 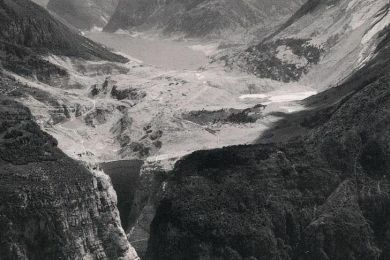 At the time there were experts around who were of the opinion that the side of neighbouring Monte Toc Mountain, would collapse into the basin if it were to be dammed it up. SADE however refuted these claims and wrapped up construction in 1959. They began filling the damn in 1960. A series of minor landslides soon followed and SADE played down all talk of imminent disaster. A year later, five major earthquakes were reported which SADE also played down citing the accepted scientific fact that earthquakes never strike in the same place twice. They then proceeded to fill the basin to maximum level. Meanwhile, the mountain itself was also shifting downward at a rate of a 1 meter a day. In 1963 after fate had decided it had been tempted enough, rain joined forces with a massive landslide into the reservoir which created a 750-foot tall wave, that wiped out the villages of Erto and Casso. The Italian government which owned the dam at the time blamed it on an act of God and after a lengthy trial, SADE was held responsible but never forced to pay damages.